At the beginning of May someone in our forums noted that the SSL security certificate had expired for the domain DateHookup.com. With the expiry all interent browsers would present someone who visits DateHookup.com with an error message explaining that the certificate is invalid. At this point the visitor has the option to continue on to the site or not. A SSL certificate allows the use of the https protocol and any information that passes from the internet browser to the DateHookup web server would be encrypted. If the certificate is invalid or the website uses only http protocol then the information traveling between the web browser and the server could be retrieved by a hacker with the right tools. Updating your SSL certificate usually is an easy process and I am surprised to see that it was not done. The story is not over yet, yesterday I noticed DateHookup.com is now completely inaccessible. The DateHookup.com server now returns no response when you visit it. This has been confirmed in our dating forums as well. This means the site is completely down either due to a software issue causing the server to crash or the actual server itself maybe having a problem which prevents it from operating. DateHookup was launched way back in 2002 by Dusty Weirich (around the same time as Plenty of Fish) and quickly grew into a busy dating service. In it's prime DateHookup was the 6th most visited dating site and received over 1 million unique visitors a month. 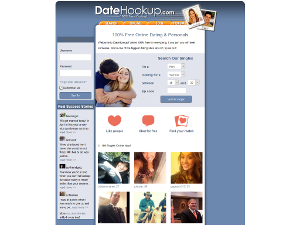 In 2012 Match Group (owned by IAC) purchased DateHookup for an undisclosed sum. Over the next few years it continued to operate as normal and even had a bit of a redesign. In 2015 users started to report that DateHookup would redirect them when they logged in or try to join, to Match.com. Ever since the acquisition, DateHookup was never really promoted or stayed current with it's competitors by adding new features or building a dating app. Match Group seems to have let DateHookup slowly fade from memory, which is too bad. When we have more information on this story we will update this article (and the review if DateHookup is truly closed). For more on this online dating service you can read our DateHookup review. Does anyone know what site is close to DateHookup? It was really fun and we also had trips where we all met together. Unfortunately I didn't keep the names I wonder where most of them went anybody have a clue? I was in Florida chat mostly. I to liked datehookup but I know a lady who abused this site and others putting up fake profiles. Thousands of them due to her jealousness and her mental illness and police refuse to do anything about her.she has done this to plenty of fish and more dating sites. She needs to be arrested for stealing people's identity as she uses men and women. For one I think this is ridiculously insane and she needs arrested. They have a group on facebook. It's a closed group and different name. I was offered to join but declined.